Trump Adviser Bolton Says U.S. Withdrawal From Syria Is Conditional On Defeat Of ISIS After declaring victory over ISIS last month, President Trump now says U.S. forces in Syria "won't be finally pulled out until ISIS is gone," echoing words from National Security Adviser John Bolton. 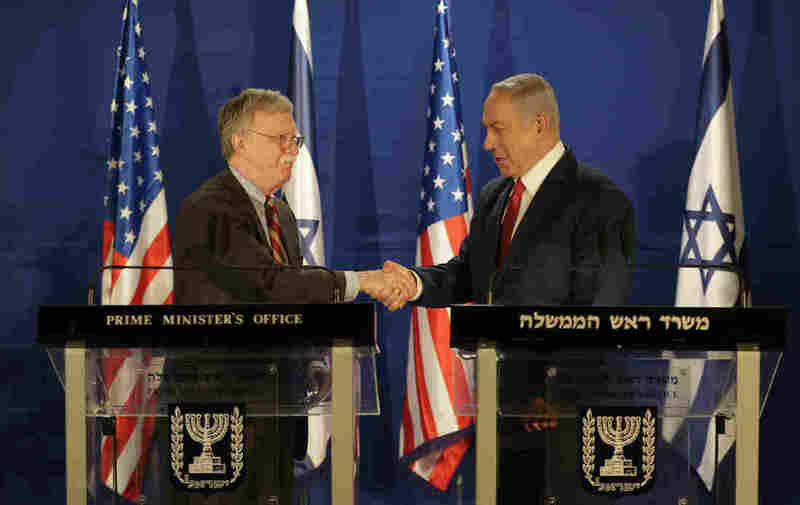 U.S. National Security Advisor John Bolton (left) and Israeli Prime Minister Benjamin Netanyahu shake hands during a joint statement to the media follow their meeting, in Jerusalem on Sunday. With the White House facing criticism over President Trump's decision to withdraw U.S. forces from Syria, National Security Adviser John Bolton on Sunday said the drawdown will be conditioned on the defeat of the Islamic State and the safety of Kurdish allies. "Our boys, our young women, our men, they're all coming back, and they're coming back now," Trump said in a video declaring victory over ISIS on Dec. 19, as reports began to surface that he would withdraw troops from both Syria and Afghanistan. That announcement was met with criticism from members of both parties, and was followed by two high-profile resignations: Defense Secretary Jim Mattis and Brett McGurk, the U.S. envoy to the coalition fighting the Islamic State. Mattis turned in his letter of resignation the following day, citing the president's right to have a secretary of defense "whose views are better aligned with yours." McGurk announced his resignation several days later. "The recent decision by the president came as a shock and was a complete reversal of policy that was articulated to us," McGurk wrote in an email to colleagues obtained by The New York Times. "It left our coalition partners confused and our fighting partners bewildered." Bolton said that the U.S. would continue negotiations with Turkish officials to secure protection for Kurdish allies in the northeastern part of Syria. Syrian Kurds, who have fought ISIS alongside American forces, fear an attack from Turkey when the U.S. withdraws. While the U.S. has relied on Kurdish forces, known as the YPG, in the fight against ISIS, Turkey considers the group an offshoot of the Kurdistan Workers' Party, or PKK. That group has been classified as a terrorist organization by both the U.S. and Turkey. After Trump announced his withdrawal plan, Turkey began to deploy military vehicles and troops close to a northwest Syrian town that it has long sought to capture, Bloomberg reports. Bolton has urged Kurdish allies not to seek protection from Russia or Syrian President Bashar al-Assad's government. "I think they know who their friends are," he said. Fighting alongside Arab and Kurdish forces, American troops have been largely successful in pushing back the Islamic State and stabilizing the country, since entering Syria in 2014. But Pentagon officials say about 2 percent of the group's self-proclaimed caliphate remains in the country. He has essentially carried on with President Obama's policy in Syria, launched in 2014, when ISIS was at its peak, and defined by an aggressive bombing campaign and a small number of U.S. forces who work with the Kurds and other U.S. partners. The U.S. has an estimated 2,000 troops in Syria, mostly in the northeast. Dismantling ISIS has been an important achievement, and has come at a far lower cost compared to other U.S. military engagements in the region. Critics of the Syria withdrawal, including Sen. Lindsey Graham (R-S.C.), who is normally a close ally of the president, have said a quick withdrawal would be a mistake, in part because it could leave the region vulnerable to a possible ISIS resurgence. The president provided no firm timetable on Sunday for a pullback, simply telling reporters, "It's going quickly." Additional details are expected to be discussed on Monday, when Bolton travels to Turkey for talks with President Recep Tayyip Erdogan.